We will save the markets, not the climate. That is how we can summarize the outcome of the 17th Conference of Parties (COP17) to the United Nations Framework on Climate Change (UNFCC) which took place in Durban, South Africa between 28 November and 10 December 2011. There is a striking contrast between the rapid response by governments and international institutions at the onset of the economic and financial crisis of 2007-08 in bailing out private banks with public money and the complete immobility they demonstrate in response to climate change. Yet this should not surprise us, because in both cases it is the markets and their accomplices in government who come out as winners. There were two central themes at the Durban summit; first, the future of the Kyoto Protocol which expires in 2012 and the ability to put in place mechanisms to reduce greenhouse gas emissions, and, secondly, the launch of the Green Climate Fund approved at the previous summit in Cancun (Mexico) with the theoretical aim of supporting the poorest countries to face the consequences of climate change through projects of mitigation and adaptation. After Durban, we can say that a second phase of the Kyoto Protocol remains empty of content. They postponed any real action until 2020 and ruled out any binding regulations to reduce greenhouse gas emissions. It was the representatives of the most polluting countries, headed by the United States, who argued for an agreement based on voluntary reductions and opposed any binding mechanism. The Kyoto Protocol was already inadequate, and its strict application would lead to a small slowdown of global warming. But now we are on a path that can only make the situation much worse. Another example of the commodification of the atmosphere was the endorsement by the United Nations of capture and storage of CO 2 as a mechanism for so-called clean development, whereas this procedure is not intended to reduce emissions and will help to seriously deepen the environmental crisis, especially in developing countries that are candidates to become cemeteries of CO 2 in the future. The results of the Summit therefore cause an increase in green capitalism. 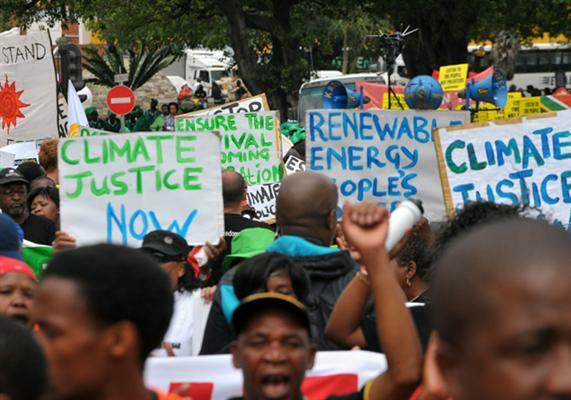 South African activist and intellectual Patrick Bond denounced it like this: “The trend towards commodification of nature has become the dominant philosophical point of view in environmental governance. ” In Durban, we repeated the scenario of the previous summits, such as Cancun in 2010 and Copenhagen in 2009, where the interests of large transnational corporations, international financial institutions and the elites of the financial world, both North and South, are given priority over the collective needs of the people and the future of the planet. In Durban, not only our future was at stake, but also our present. The effects of the ravages of climate change are already being felt; including the release of millions of tons of methane in the Arctic, a gas 20 times more potent than CO 2 in terms of atmospheric warming. Then there are the melting glaciers and ice caps which is resulting in a rise in sea level. These effects are already increasing the scale of forced migration. In 1995 there were approximately 25 million climate migrants; that number has doubled now, with 50 million. In 2050, this number could be between 200 million and 1 billion people displaced. All indicators show that we are moving towards an uncontrolled global warming of more than 2°, which could rise to about 4° at the end of the century. Scientists believe this will most likely trigger unmanageable consequences such as a very significant increase of sea level. We cannot wait until 2020 to start taking action. But with the lack of political will to tackle climate change, resistance does not, however, dry up. In a movement parallel to Occupy Wall Street and the wave of indignados which has reverberated round Europe and the world, many activists and social movements met in a daily forum a few meters from the official conference centre with their initiative called “Occupy COP17.” Participants ranged from farmers struggling for their rights to representatives of small island states like Seychelles, Grenada and the Republic of Nauru (Oceania, Micronesia) who are threatened by an imminent rise in sea level, to activists against debt who are demanding the repayment of ecological debt from the north to the south.